Last year, I decided to try my hand at a post-a-day challenge (dailypost.wordpress.com), and failed spectacularly. As our wedding loomed closer, I stopped doing a lot of things I’d been trying to make into a habit. And now that the wedding is over, things still don’t seem to have let up. But I’m not going to let being busy be an excuse for not accomplishing goals! I finished all of their socks in time! 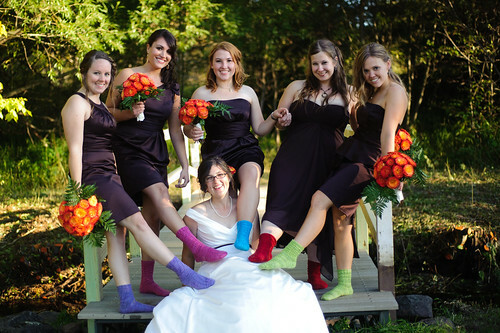 I had wanted to do a pair for myself, too, but that didn’t happen before the wedding. I had previously tried to use this blog as mostly a craft blog, with some deviations. I will still probably post about crafts pretty regularly, but another goal for this year is writing. My goal is to write, even a little bit, every day. And I don’t mean just writing this blog. I started a novel for NaNoWriMo in November, and while I reached the 50,000 word count goal, I did not finish the novel. I still have not finished the novel, though I’ve been working on it regularly throughout December. I plan to continue the novel (rough draft almost done! revisions ahead!) until it is done. I also hope to write and post some short stories. My main blog-related challenge is to post every day, even if it’s just a photo or a little bit of text. Then, the goal going with that is to have at least one longer, substantive post per week. Knit more, spin more, weave more. Sell some crafts on Etsy. Also, I’ve recently joined the ranks of Twitter. I know, I’m awesomely late to it. But you can follow me at the username nikkinbird. So there you have it! See you tomorrow!